Sitelinks are an important part of successful ads. They show value to potential customers before a click occurs, while also being (along with other extensions) a factor of ad rank. User interaction with sitelinks is so strong that you should consider them a basic part of your ad text - title, description, display URL and sitelinks. Optimize the messaging in this space routinely, just as you do with ad text. Many advertisers aren’t taking advantage of this excellent feature just yet, so before we start optimizing you may need to implement them. Adding sitelinks boosts the average CTR on an ad by 10-20% (+20-50% when the search is one of your branded terms), so that implementation should be time well spent. Make sure to have at least six active sitelinks for desktop and four active sitelinks for mobile, but remember that you can go all the way up to twenty total per ad group or campaign. Sitelinks allow 25 characters for the link itself, and that space allows for testing. We’ve found that somewhat shorter sitelinks are the most effective, though, so try to keep them closer to 18-20 characters for desktop and 12-15 characters for mobile. 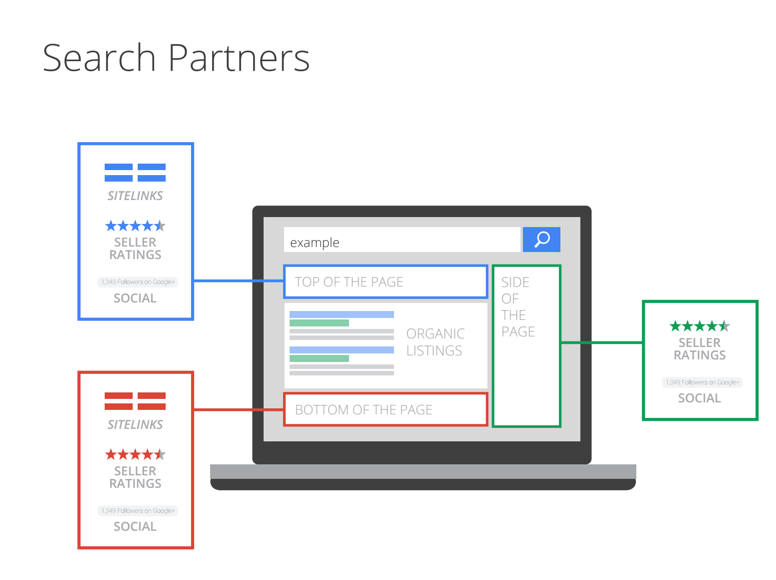 We think sitelinks are a great proven feature, and we also think that they can be made better. Start by knowing how you’re doing. When reviewing these statistics, remember to compare sitelinks to one another and not to overall ad performance (as CTR on sitelinks is almost universally lower than a click on an ad, even though an ad with sitelinks will perform better than an ad without sitelinks). You can also look at a sitelink’s contribution to the entire creative. If you segment by “This Extension vs. Other” you can see if that extension is encouraging clicks on the headline or other links. Identify your strong performers in terms of CTR (on the link itself or the surrounding ad), conversion rate, and conversion volume to establish a baseline of what target you can shoot for with low performers. If certain sitelinks aren’t receiving a lot of impressions they’ve been passed over by the system, which means that you could probably work on improving those first. Once you’ve found what’s not working, try out new text to improve performance. If CTR is fine but your conversion rate is lagging, you could be sending traffic to the wrong page or setting user expectations incorrectly with a misleading link. As with your ads, even top performers could potentially be improved upon. Think about something new you may want to try. When viewing your sitelink data, the info is available at the ad, ad group, campaign, and account level. Add or remove these columns on the Ad Extensions tab to determine just how specific you want your info to be. Pure A/B testing isn’t possible because each sitelink must point to different content. When you’re identifying what’s lagging behind, recognize that other variables can muddle your results (things like ad tests, bid changes or seasonality). You can try out variations of sitelinks in different campaigns or sets of ad groups to see what works better, but it’s still not going to be a perfect solution. Recognize the imperfection of this whenever reviewing your results. Sitelink testing shouldn’t be as frequent as your ad testing (due to the lack of A/B testing). Monthly or quarterly reviews might make sense for you, depending on your volume. Apply ad copy testing principles to your new sitelinks. Think of distinct calls to action and benefits that relate to a user’s search and the page you’re directing them to. You can also take lessons from previous ad tests and apply them. For example, you can use losing (but still strong) ad copy as your sitelinks or their descriptions. You also have the option to add additional detail to your sitelinks, which is great opportunity to prove value to customers before they click. At present, sitelinks automatically serve descriptions where appropriate. That feature is going away in the near future, though, so add in descriptions yourself sooner rather than later. Try to speak to mobile users. 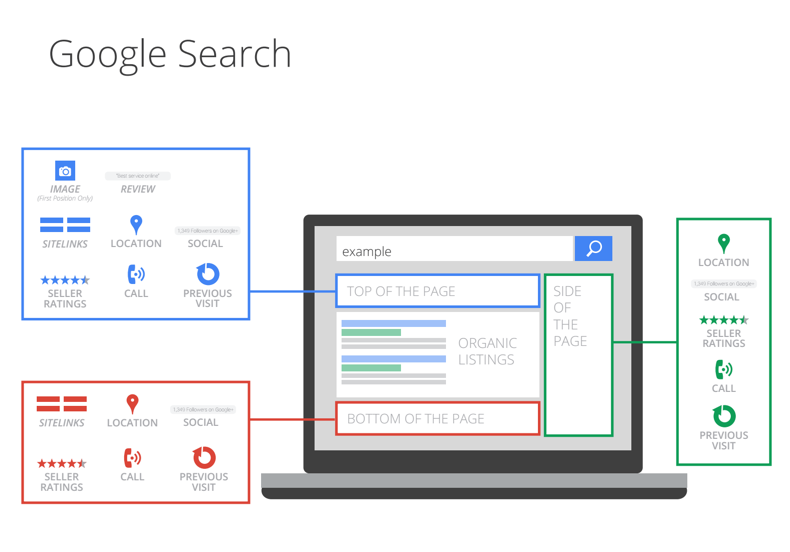 Think about mobile intent and how it differs from desktop, and then reflect that way of thinking in your sitelinks. You’ll also want to keep mobile sitelinks shorter (to around 12-15 characters) to ensure they aren’t cut off. You can show users valuable information about your site right in your ads via sitelinks. It’s imperative that they’re present, and once they’re there you should focus on making them as good as they can be (just as you do with the ads themselves). Sitelinks not only increase the relevance of your ads, they increase the relevance of the user experience you deliver after the click. We recognize that if you use more than one Google service, you want colors to be consistent and controls to be in the same place across everything you use so you can get to them quickly and easily. We also know it’s no fun to have to scroll down as soon as you log into your account to see the things that are important to you. By updating AdWords to the look and feel that we use across Google, you’ll spend less time getting where you want to go in your account, and more time focusing on growing your business. Billing, Account Settings (formerly My account) and Help have moved under the gear icon. In the past, you might have looked in a few different places before finding important menu items in your account. 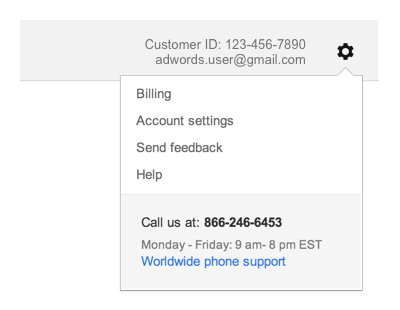 We’ve made Billing, Account settings, and Help easy to find by placing them in the same gear menu used in Gmail and Calendar. Charts, tables, and tools have more space on the page. Important information in your campaign management tabs is now above the fold. We’ve given more screen space to the charts, tables, and tools you care about most so you’ll spend less time scrolling and more time optimizing. You should see these changes roll out to your account in the next few weeks. We hope that the new design will help you better navigate through your account and focus more on your data so you continue to grow your business. For more information about the redesign, please visit our AdWords Help Center. in the top right hand corner of most of our Display ads which gives users the ability to control ads they no longer wish to see. To date, users have muted millions of ads and we have used these signals to make ads more relevant and useful. Over the next few weeks, we’ll be expanding the ways users can give us feedback about ads by introducing a series of short surveys in English-speaking countries which will appear after an ad is muted. These surveys will help us understand why users mute ads, serve better ads to users, spot publishers and advertisers in violation of Google’s policies, and help improve ad and placement quality for the broader advertising ecosystem. Investing in ad controls with tools like Ads Settings and Mute This Ad enables us to deliver better experiences for users and better results for advertisers and publishers. Last year, we placed a small [X] mute control button in the top right hand corner of most of our Display ads which gives users the ability to control ads they no longer wish to see. To date, users have muted millions of ads and we have used these signals to make ads more relevant and useful. People are constantly connected and moving from one device to another as they communicate, shop and stay entertained. 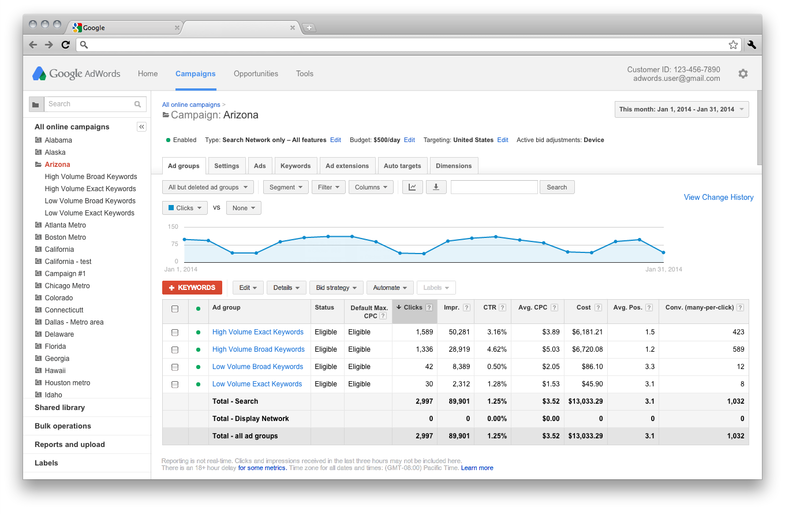 So last February, we introduced enhanced campaigns for AdWords. With enhanced campaigns, it became much simpler to manage campaigns across multiple devices while optimizing for your customers' intent and context -- like their location and time of day. Along the way, we shared lots of best practices and case studies showing ways to improve your website and grow your business by engaging customers on screens of all sizes. On top of the new enhanced campaign architecture, and over the course of the year, we went on to add powerful bidding tools, a new audience dimension for search ads, and advanced conversion measurement. Setting bids to get the best results is important, but it can also be difficult and time consuming. That's why many advertisers use automated tools to save time and more consistently achieve their performance goals. So in addition to the manual bid adjustments in enhanced campaigns (see our "Bid Like a Pro" guide), we launched new, more flexible automated bidding strategies. Flexible bid strategies let you selectively apply strategies like Target Cost Per Action or Target Top of Page Position within your campaigns, so you can choose the most appropriate manual or automated bid strategy for your keywords and ad groups. Several of our automated strategies, including the new Target Return on Ad Spend (ROAS) strategy, use unique real-time prediction systems that automatically adjust your bid for each auction based on the expected value of a potential click. Many advertisers and agencies, including Point It, have tested and found strong results. Advertisers have consistently asked us for the ability to tailor search ads to the needs of their best customers. So in June, we introduced a valuable new audience-based capability to search ads: The ability to tailor your bids, ads or even keywords based on a user's previous visits to your website. Thousands of advertisers, such as Tirendo and WorldStores, have since taken advantage of bidding more optimally for past site visitors to increase their ad visibility, drive incremental sales, and improve ROI using remarketing lists for search ads (RLSA). Many businesses, like American Apparel and Room & Board, count on AdWords to drive phone calls, visits in store, and orders placed through a sales rep. This year, we've made significant strides in making these conversion objectives measurable in AdWords so you can better optimize and allocate budget. We added the ability to measure conversions across accounts, import conversions into AdWords from a CRM system, and count phone calls as AdWords conversions. We also introduced a new metric, estimated cross-device conversions, to help you better measure conversions that start with an ad click on one device and end with an online conversion on a different device. As we look ahead into 2014, we're thinking a lot about ways to amplify your productivity in AdWords. We want you to keep the power, but streamline the work. So you can expect substantial improvements around workflow efficiency, campaign planning, analysis and reporting, opportunity identification, and testing. We're also developing ways we can make it easier to run AdWords campaigns as a direct extension of your business. This means providing ways to bring your business and website data more directly into AdWords, and allowing campaign elements to work in a more seamless, dynamic, and optimized manner. And we'll continue innovating with new ways to measure marketing performance in a constantly connected world. What's on your wish list for 2014? We get a lot of great ideas from your suggestions and feedback, so please keep it coming. Tell us what's on your wish list for 2014 at http://g.co/awfeedback. You can also keep up with all the latest updates on AdWords on our Google+ page. We're excited to make AdWords even better for you in 2014. Thanks again for your partnership. We're excited about the results we've seen advertisers drive using innovations in AdWords throughout 2013. I wanted to recap a few of the improvements that stand out for me in terms of helping advertisers better connect with consumers and grow their business. I'd also like to share a glimpse at some of the improvements we're planning in AdWords in 2014 and ask for your suggestions and feedback.